Completed on the 13th of September 2001! A few months ago, I decided it was time to build a pair of full range tower speakers to compliment my home theater system. 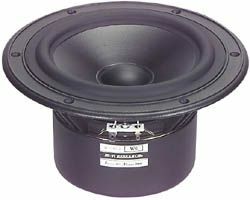 So I got on the Internet and began searching for kits and raw drivers that might make a good pair of tower speakers and be within an allotted budget. Now budget is everything. 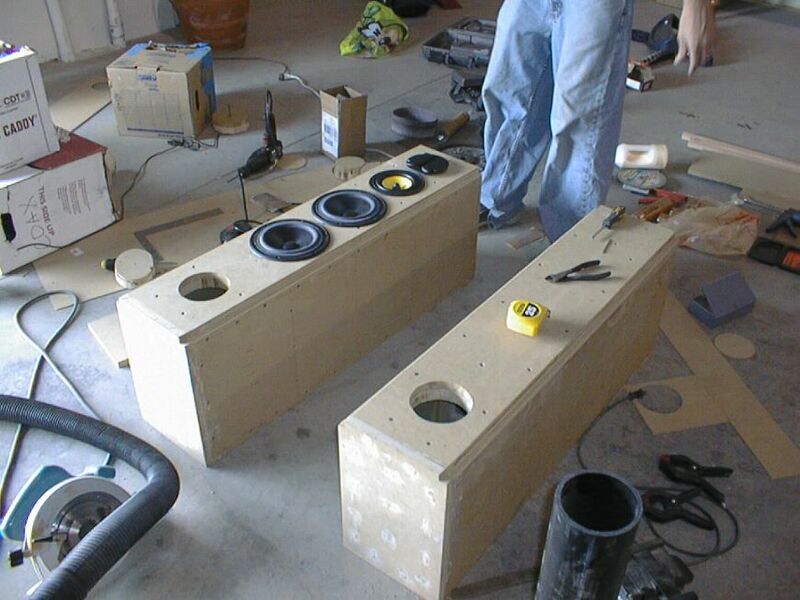 Now the intent wasn't to build a pair of speakers on a cheap budget. But I had considered a price range of around $600-800 for the pair. So this is what I have tried to stick with. My initial designs consisted of all Scan-Speak drivers. I was downloading and studying every aspect of their top few drivers. 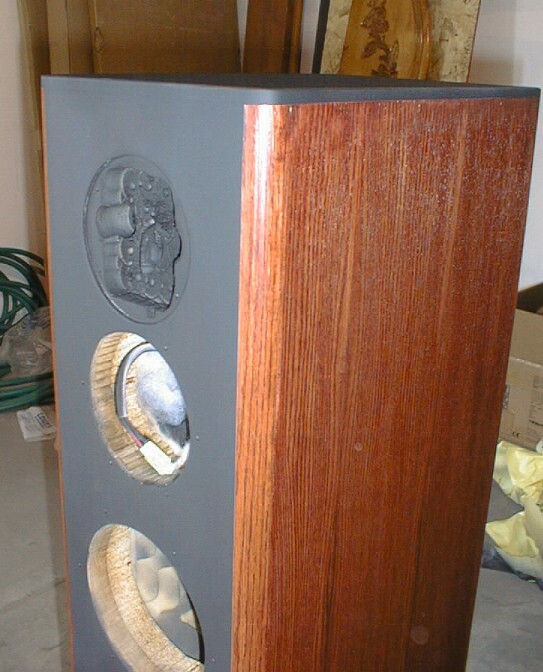 I looked up other projects that used the speakers I wanted to use and then read everything I could about their design and performance. There was always one thing that bothered me most about these expensive highly acclaimed drivers - the crossover was not a simple one. No one put a simple 2-way network on their 18W8545 driver. The response of that driver is nothing even close to flat, and it takes some pretty powerful software/hardware to model it accurately and produce a useable crossover for it. So pricey drivers + cheap-o crossover = bad experience. I couldn't convince myself to spend that kind of money on raw drivers, when I knew I'd be shooting in the dark with the crossover. Okay back to the Swans M3. 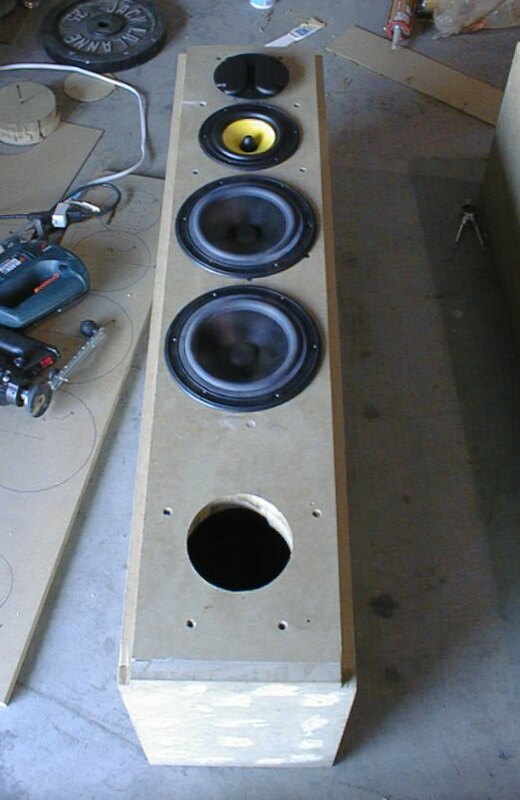 How did I decide to build this speaker? Swans doesn't even sell this speaker system anymore. Their web site has no information on it whatsoever. If you do a search on the web for it, the only thing that pops up are a bunch of discussion forums in Chinese. 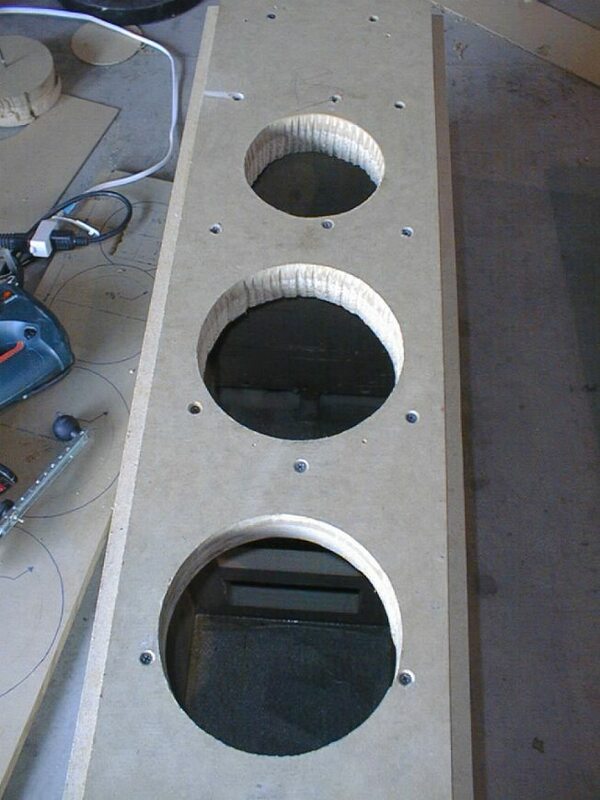 As far as I'm concerned, no one this side of Asia has actually built a Swans M3 speaker. So leave it to good ol' Parts Express to do a factory buyout on tons of Hi-Vi Research drivers including all the drivers to make the M3. Not only that, but they were also offering the original crossovers. 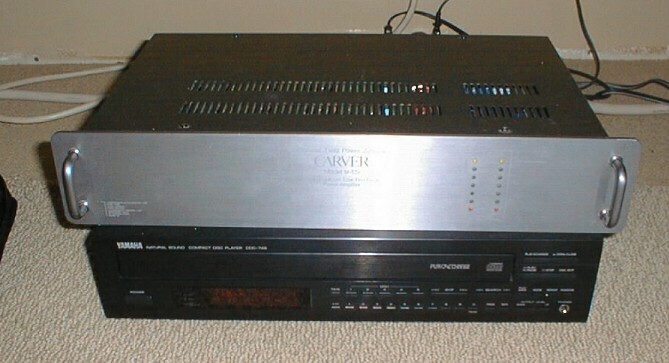 That's right, the original crossover as designed, and manufactured by Hi-Vi Research. I could buy all the drivers for half what they retailed at and not have to do an ounce of crossover design. It also helped that the crossovers were selling for $9.95. Less than 1/4 their retail worth. 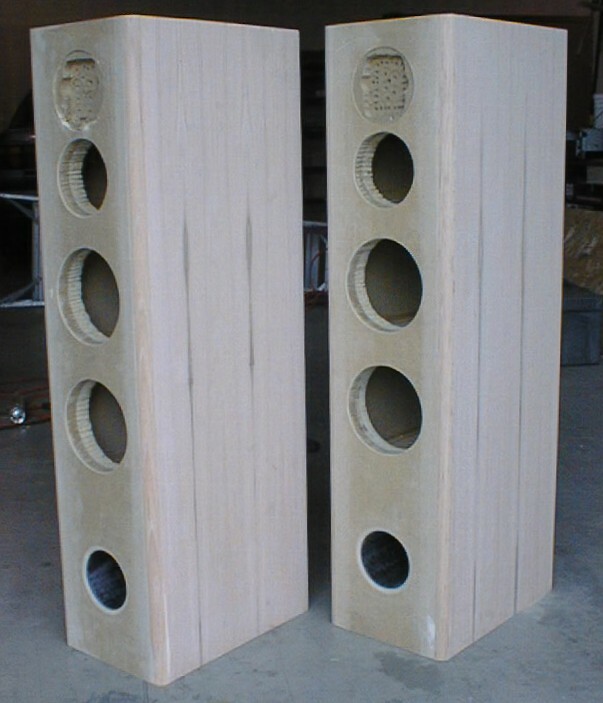 Not only could I get away with building a great pair of tower speakers, they were easily going to fall within my budget, and I wouldn't have to design or even build the crossovers. So quickly I ordered up all the necessary parts to get myself rolling on building this brand new Swans M3 tower speaker system. I ended up getting the crossovers from a guy named Jon who I met on the PE discussion board. He came to my aid when PE sold out of the crossovers before I had a chance to purchase them. 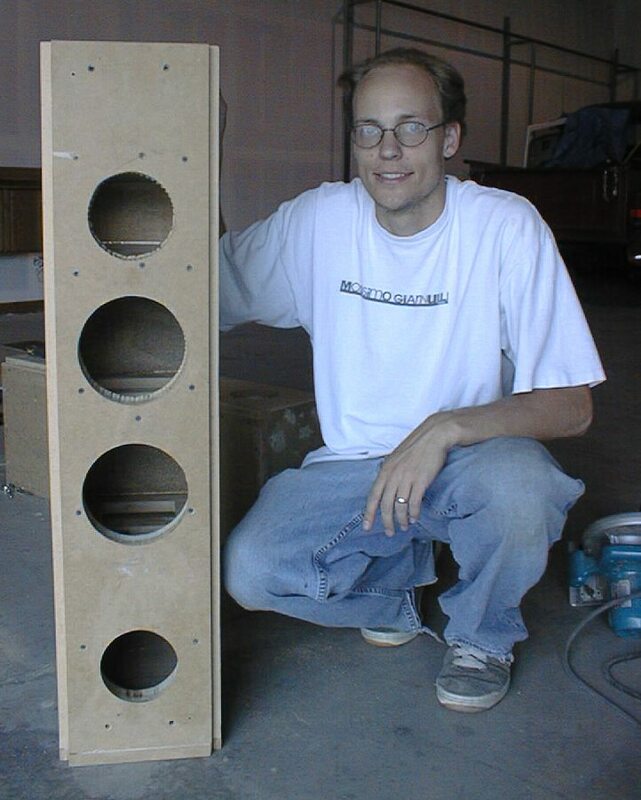 He in the end didn't need them and actually gave them to me, and in exchange asked me to cut for him a few 4-3/4" round pieces of wood to fill the tweeter hole for the RT1C which had sold out before he had a chance to purchase them. Just wanted to say thanks Jon! You made this whole project possible. Now finding information on this kit is impossible. Even writing to Swans and calling them on the phone numerous times did me no good. They never returned my calls and never responded to my e-mails. So all the information and pictures I did mange to find I have included here in this web page. So if you want to learn more about this kit, look no further. What I found were pictures, cabinet drawings and crossover schematics. 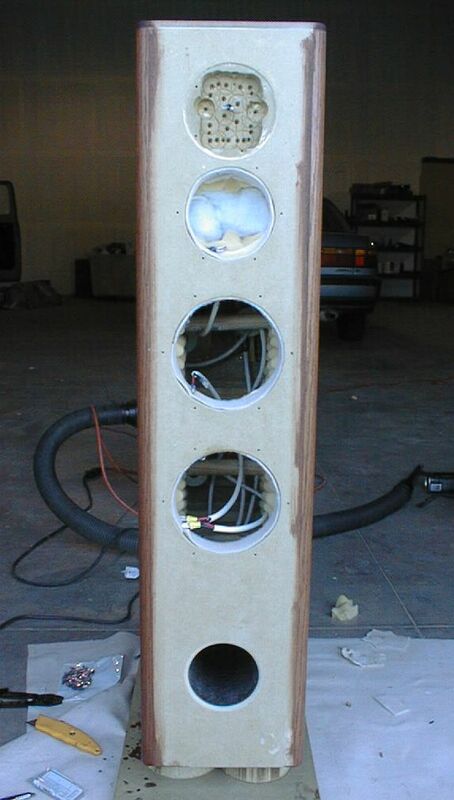 Now cabinet design is an area I know a little bit more about, so if I wanted to get to say that I truly designed and build this speaker, I would at least have to do some of it myself, being that the crossover and driver choices were made for me. So I designed the enclosure to my own tastes and likes. It does model the original design by Swans. 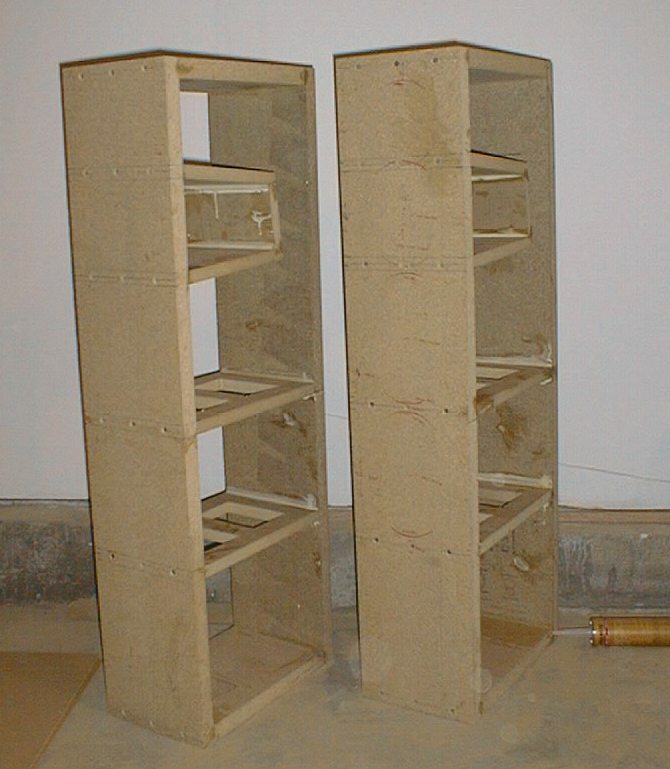 Just about the same height, same width, yet I opted to go with 1-1/8" PB combined with 3/4", 1/4" and 1/8" MDF with substantial bracing. So my enclosure is actually a little bit deeper, taller, wider and heavier than what they called for. But I did shoot for the same internal volume and tuning frequency. 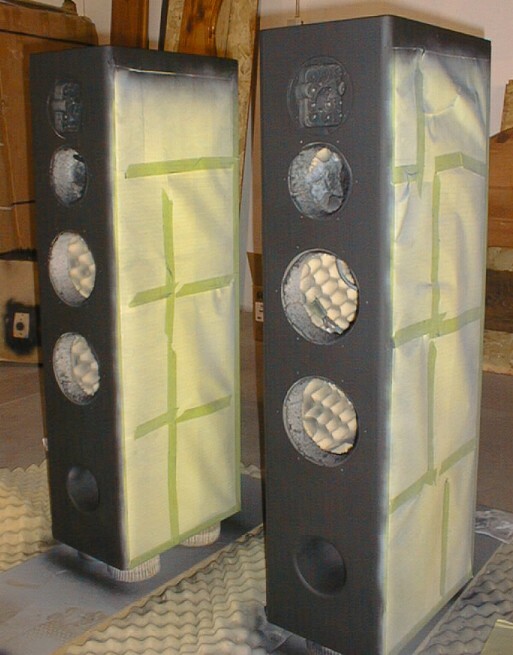 To the right I have posted pictures of these speakers as they have progressed from raw pieces wood to final shape and form. In this web page I'll talk a little bit about what I'm doing and why I'm putting it together a certain way or whatever. Just to introduce the pictures to the right, the first picture way at the top is one version of the Swans M3. 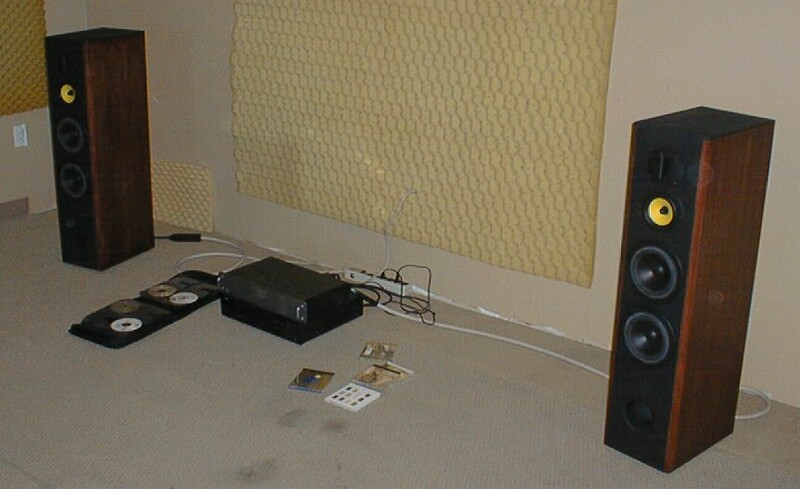 This one used the F6 instead of the W6 and placed the woofer on top of the tweeter. They later changed the design to reflect the one I'm building now. Which I think looks better anyway. Then we have the drawings by Swans outlining how to build the enclosure. Pretty fancy and well done, but I didn't use them. The crossover schematic is the most important picture here. It clearly shows all the necessary values for each element of its design. Not only that but it shows the proper positive and negative wiring to each driver. You'll notice that for each driver, polarity and phase is maintained. This is important to note because on the actual crossovers themselves, there are little plus and minus signs marked for each driver. They state, however, that polarity is reserved for the midrange and the tweeter. 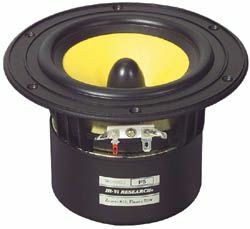 I thought this was rather odd, till I read an article in VOL III of Speaker Builder's 1999 issue where they did a review on the Swans M1 (which is basically the Swans M3 minus the bottom two drivers). Besides that speaker getting an absolute stellar review, Dennis Colin mentioned that he had noticed that on the crossover board, it was also mislabeled as compared to the schematics. 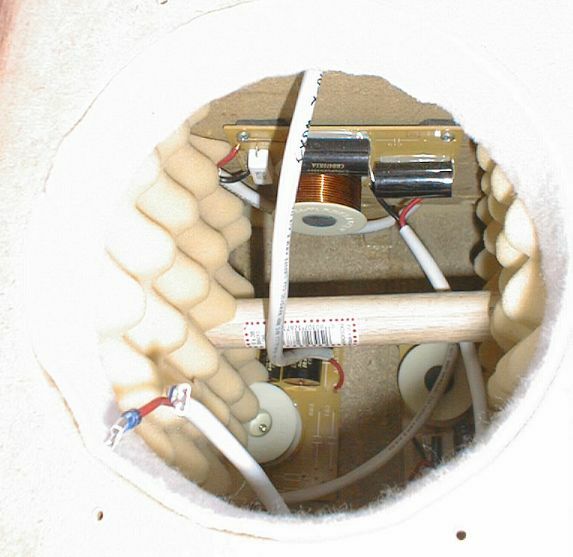 He ended up wiring the speakers to reflect the schematic and found that to be the proper wiring scheme. So I will do the same. 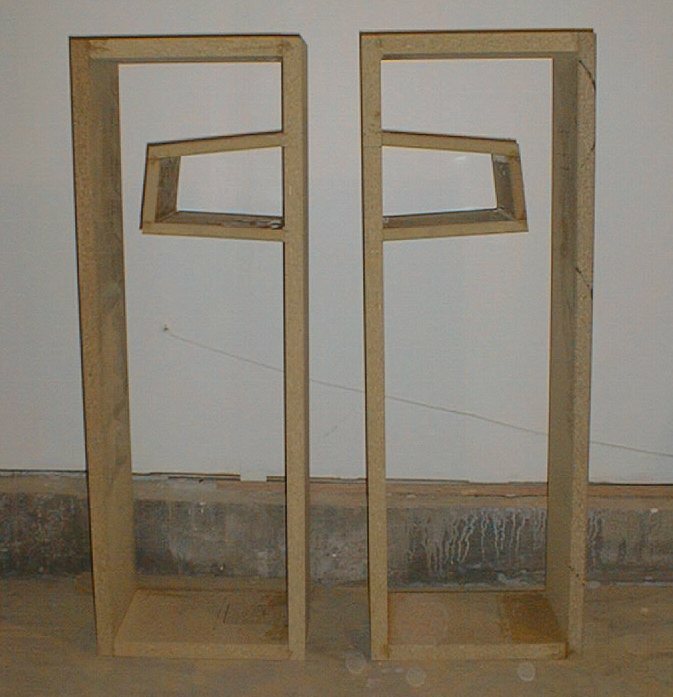 Since the tweeter topology is identical for the two kits. The next three pictures are of the three drivers that make up this kit. The original RT1C that I had purchased had a plastic faceplate. I only bought it because it was half the cost of the aluminum one. Now that Parts Express has dropped the price of the aluminum RT1C, I decided to do the ol' switch-a-roo and exchange the plastic ones for the aluminum ones. My tweeters were 4 months old, but I never used them! Wouldn't you know that Parts Express exchanged them without question. About one week later I had a brand new pair of all aluminum RT1-C tweeters. Hats off to PE for their excellent customer care! The F5, a great midrange, smooth response, phase plug, Kevlar cone and a cast basket with matching gasket to go along with the W6. Then we have the W6. In my opinion this is a fabulous woofer. It's looks are beautiful, its response curve is very smooth (below 2KHz) and has a number a very unique design characteristics to it that make it a one-of-a-kind driver. Also to note, in the frequency range where it will be operating, the cone break-up you see above 2KHz will be eliminated since its crossover frequency is around 300Hz. At the bottom of this page you will find drivers manufacturer's measured data for each driver. All of these drivers exhibit great characteristics, from response curves to physical design. I've never been a big fan of Hi-Vi Research. I get the feeling that they're just not as popular as some of the more elite line of manufacturers. Yet I believe they can definitely hold their own. Well what I've heard of them anyway, since I haven't finished either of my speaker projects which use these drivers. I'll be sure and give a thorough review of them when they are complete. 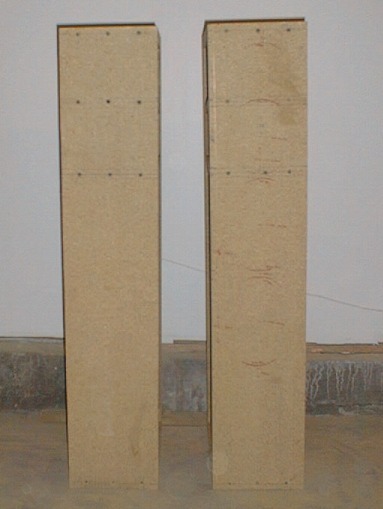 Bracing and other internal reinforcing structures. The port (OD x Length that extends into the cabinet). 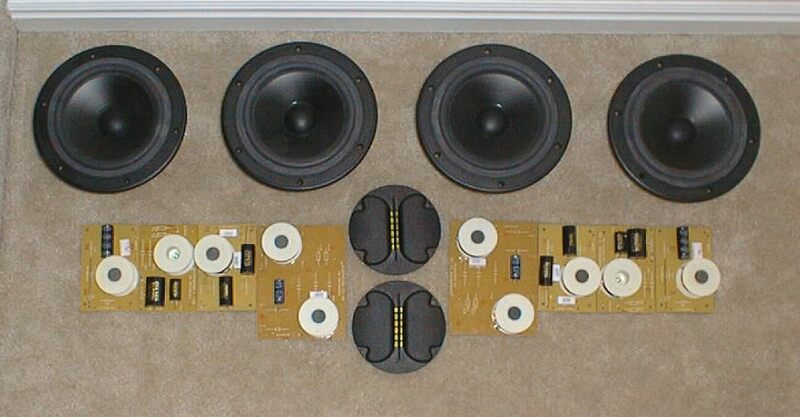 The woofers (including magnet, frame and cone). So with all that said the net internal volume will sit at roughly 1.67 cubic feet (47.7 Liters). The tuning frequency I have chosen will be 42 Hz. The port will be 4" round by about 8.33" deep. As you can see by the simulation, this is a compromised design with a small hump just above the tuning frequency. It's funny because if you look at the chart for the W6, they state that it is suppose to be used in a cabinet that's 22 L and tuned to 42 Hz. Or in the case of two drivers, 44 L and 42 Hz. That doesn't even come close to the massive amount of volume it actually takes to make the response flat. So I guess they knew that but didn't seem to be concerned by it. You'll notice the my Swans M3 cabinet is just a bit bigger than what they recommend for this driver. Which is one of the reasons I chose to stick with a tuning of 42 Hz. For some strange reason, it's what Hi-Vi expected to this driver to do in an enclosure this size. I wired the crossovers and drivers with 14 gauge MIT brand audiophile speaker cable. I've got a couple of friends who are very into the "pseudo science" of audio. Anything with a big brand name on it and a high price tag "has to sound better." Otherwise it wouldn't cost so much more, right? Well, I'll let you be the judge of that one. This speaker wire costs about $4 per foot. Very reasonably priced, especially since I only used about 15 feet of it. The crystalline structure of the copper used in this cable is suppose to be far superior than standard copper. I counted 45 strands of what appeared to be a 30 gauge wire. The jacket is very flexible and after having crimped on all my female disconnects to the ends, I was very pleased with the overall feel and look of the wire. It soldered evenly to my crossover's circuit boards and should make for an overall flawless integration of sound connecting the gold plated binding post to the terminals on each driver. Whether they sound better than any other copper wire remains to be seen (or heard). If anything, the weakest link in this audio chain will be the crossover components. Since they were prefabricated by Hi-Vi Research, I really have no idea their true make, type or real quality. I know there are 16 and 18 gauge air core and iron core inductors (blah). Mixed with Dulcet Polypropylene capacitors and a couple of generic electrolytics. I bypassed the electrolytes with Dayton film and foil caps but after doing some research, it turns out that 0.01uf bypass caps probably won't make that much a difference. David B Weems says this about standard electrolytes and using bypass caps, "If you are a purist on sound matters, bypass the NP's in woofer circuits with 33 percent of the capacitance Mylar." In the case of my midrange, I've got a cheap 150uF NP in series with my driver. The problem is to make a 150uf out of Mylar or Polypropylene caps, we're talking over a hundred dollars and massive in size. It's not feasible in most cases, and probably not all that necessary. To follow Weem's rule, I should replace the current 150uF NP with a 100uF and add a 50uF poly cap in parallel. 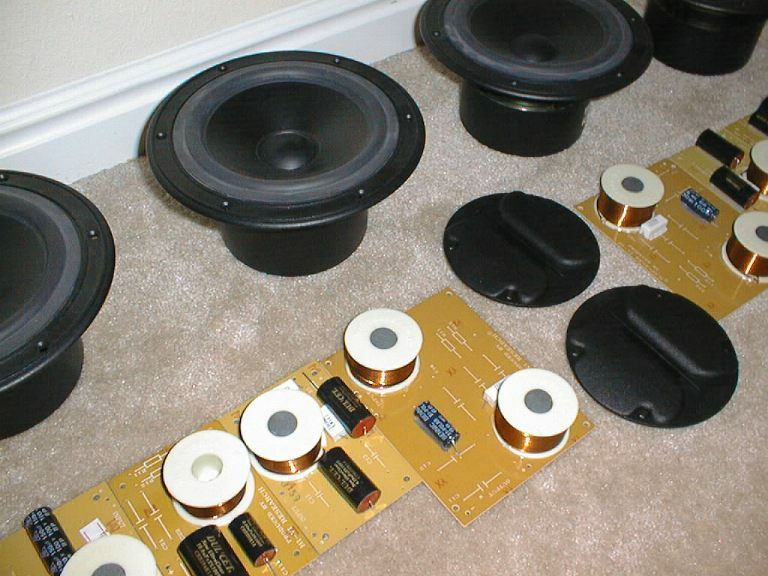 In the case of the woofers, the 68uF NP should be replaced with a 47 uF NP and a 22 uF poly cap in parallel. Now I haven't done this yet, but I may do it later. And if I do that later, I may replace some of the smaller gauge iron core inductors as well. But before I try and redesign the entire crossover, I'm going to give these a good hard, long listen before I make any drastic changes. 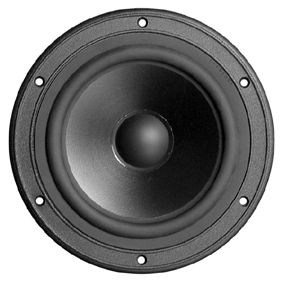 Who knows, I could make everything sounds worse, and I really do need some times to gain a good reference of how these speakers sound. The internal midrange enclosure is where I altered Swans design the most. They called for a 5" tube to extend from the front to the back of the enclosure. I just didn't like the idea that the entire crucial range of frequencies (300-3KHz) was all going to be reproduced from a driver in a tube. Have you ever placed a speaker in a tube and listened to it? It sounds terrible. I don't know if it's the cardboard or the round part of it, but it gives vocals a very hollow sort of tunnel-like sound to them. 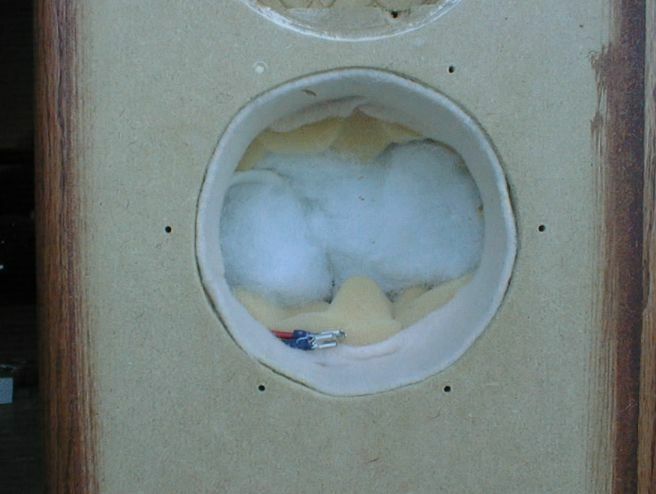 Maybe I needed more insulation on the tube I tested, but I didn't care for the sound it produced either way. Maybe its psychological. 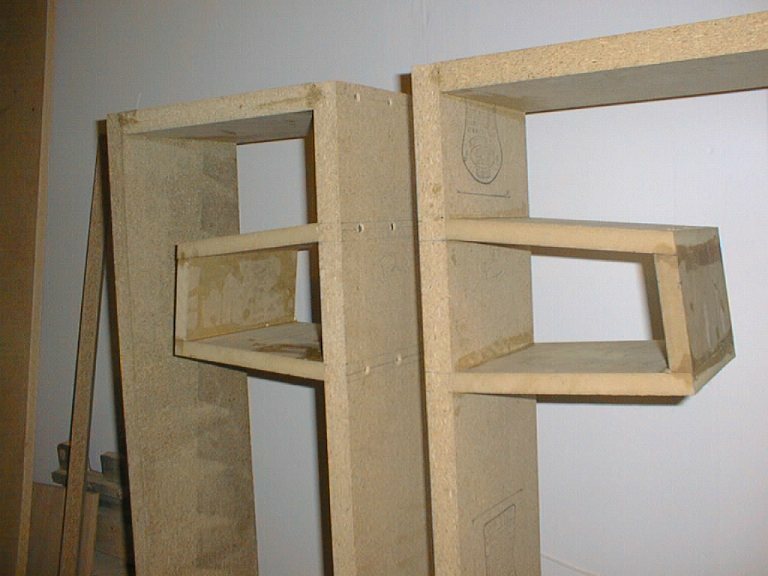 So that's why I chose to build a standard midrange cavity out of MDF and then add a few twists to the design. First thing you'll notice is the non-parallel top and bottom walls. This is to help minimize internal reflections. 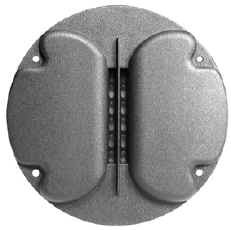 Also the rear wall is angled so as to redirect or deflect sound from radiating straight back out into the cone. Once again, minimizing internal reflections. 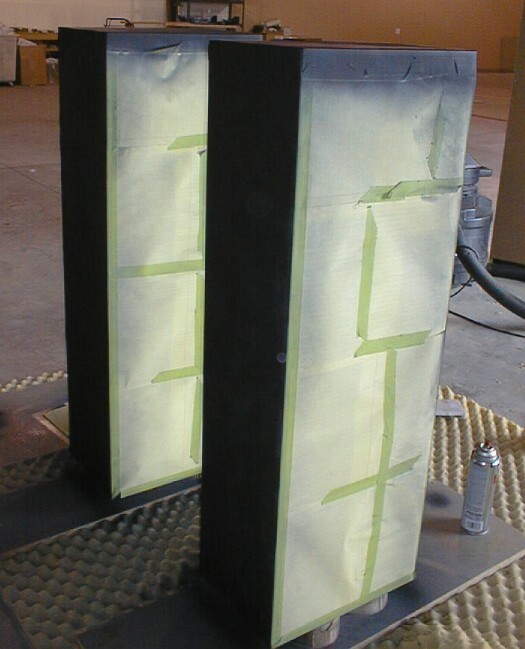 The only parallel wall this enclosure will have is on the sides. 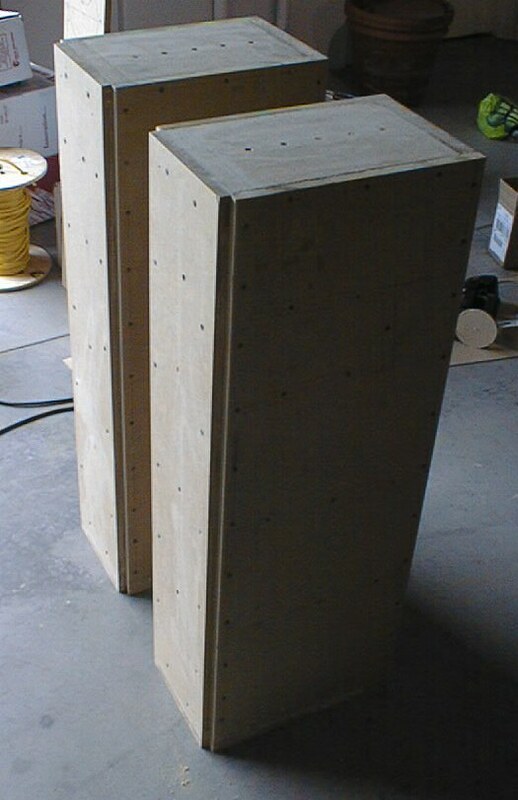 If I had made the sides also nonparallel, I would have begun to sacrifice internal volume of either the woofer enclosure or the midrange enclosure. I'm already right on the edge of where I need to be for volume. I did make the midrange enclosure 1 Liter larger than Swans had planned for with the tube. The tube would have provided about 3.5 Liters, and my enclosure will provide 4.5 Liters. This results in a system Qtc of about 0.74 which should work out just fine for my crossover point of 300 Hz. If the crossover point were any lower, or the filter rate were any shallower, I may have opted to do larger enclosure, or port the enclosure out the rear of the cabinet. Nevertheless I expect to do a great deal of experimenting with absorption materials until I get the midrange to sound as balanced, natural, and uncolored as possible. I'm thinking of something along the lines of a felt material, mixed with egg foam, wool and polyfill. We'll see what I can come up with. 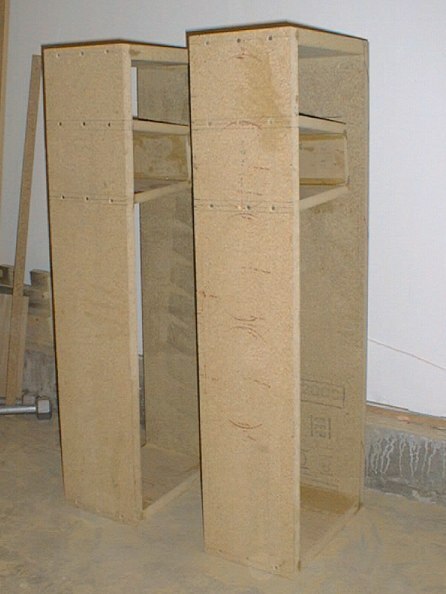 Now since the base structure was made of 1.125" particle board, I knew I would be doing some serious additions to it in order to keep density down, vibration at a minimum and structural integrity fully intact. 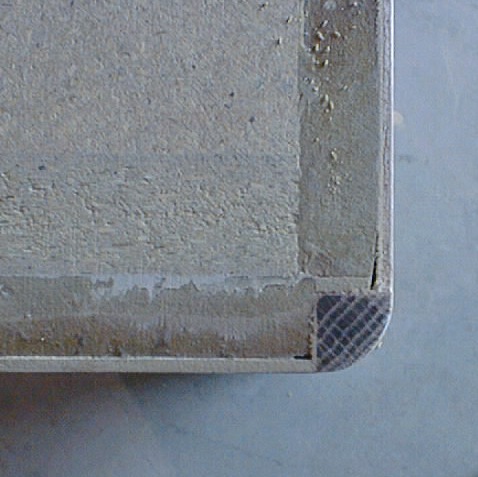 So the first thing I did was added a piece of 3/4" MDF to the front baffle. This brought its thickness to an impressive 1.875" (1-7/8"). This is definitely a suitable thickness to go with, because each driver cutout reduces that front baffle's strength. 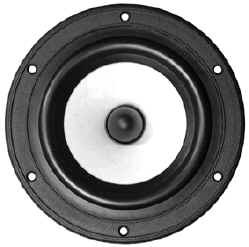 The baffle is 8.25" wide and the woofer cutouts are 6.0" in diameter. This doesn't leave much room on either side for strength, so I make up for it in depth. 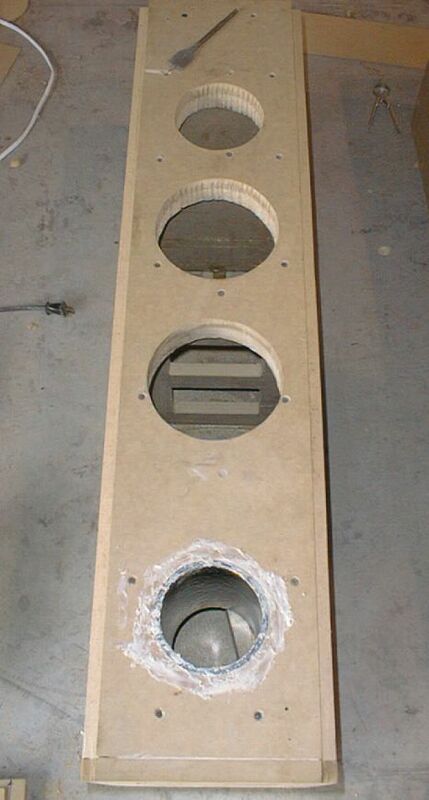 After I added the 1/8" thick flushed-baffle board for the tweeter, the overall front baffle thickness goes up to 2.0". You can see this in the pictures. 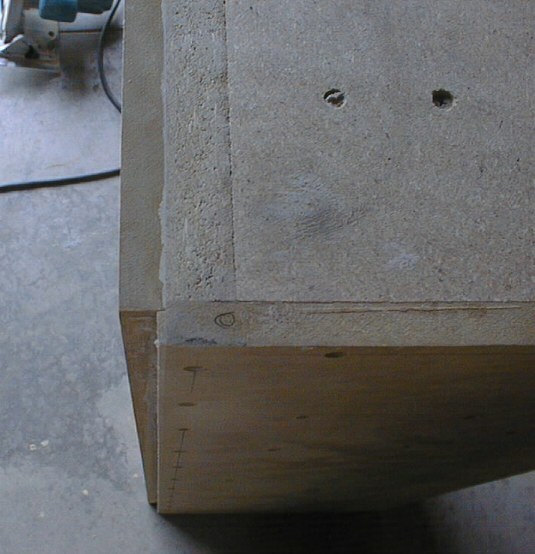 I also added a 3/4" piece of MDF to the bottom of the enclosure to give a good base for the spikes to screw into. I added a piece of 1/4" hardboard to the top of the enclosure to help reduce vibration and makes the top of the speaker 1.375" thick. Also as I have mentioned, the nice, smooth, even finish on the hardboard is much easier to paint to perfection that the PB. 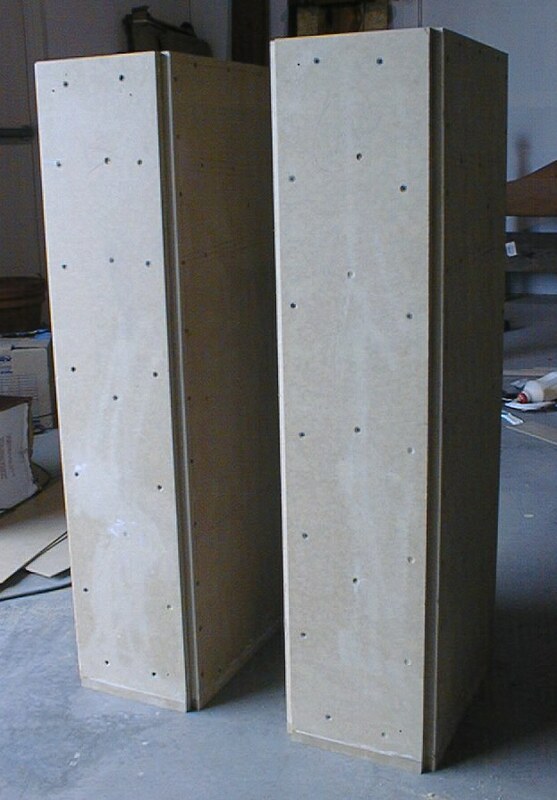 The sides of the enclosure are 3/4" MDF with 1/8" oak veneer Liquid Nailed in place I also added (2) 1" thick dowels to the insides of each driver compartment behind the W6's. I can tell right now that that is the hollowest part. The front corners have 3/4" oak quarter rounds which join the sides with the front in a seamless oak to not oak integration. The sides will be stained Red Oak from Minwax, while everything else will be painted black. Okay that's it for now. If anyone whose been reading this has suggestions for internal bracing technique or feels that some area of this design has been overlooked and it's not too late to fix, feel free to drop me a line, and let me know what you think. 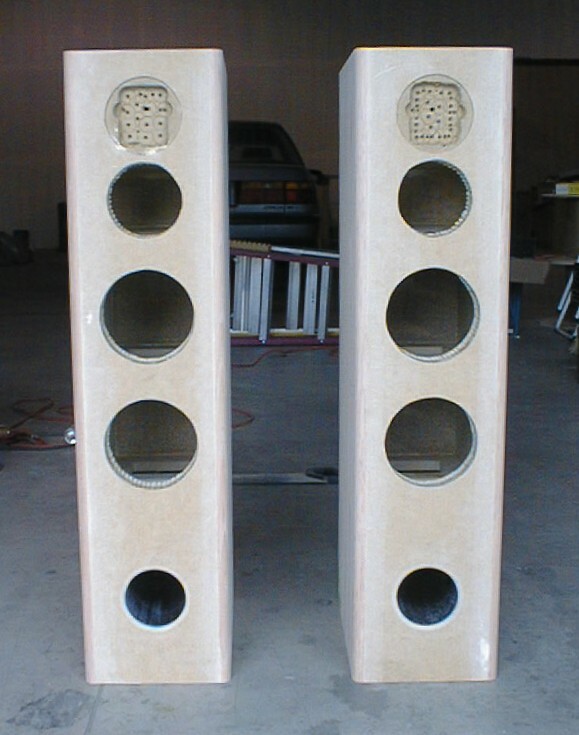 I will be more than happy to consider your thoughts into the making of these Swans M3 Tower Speakers. 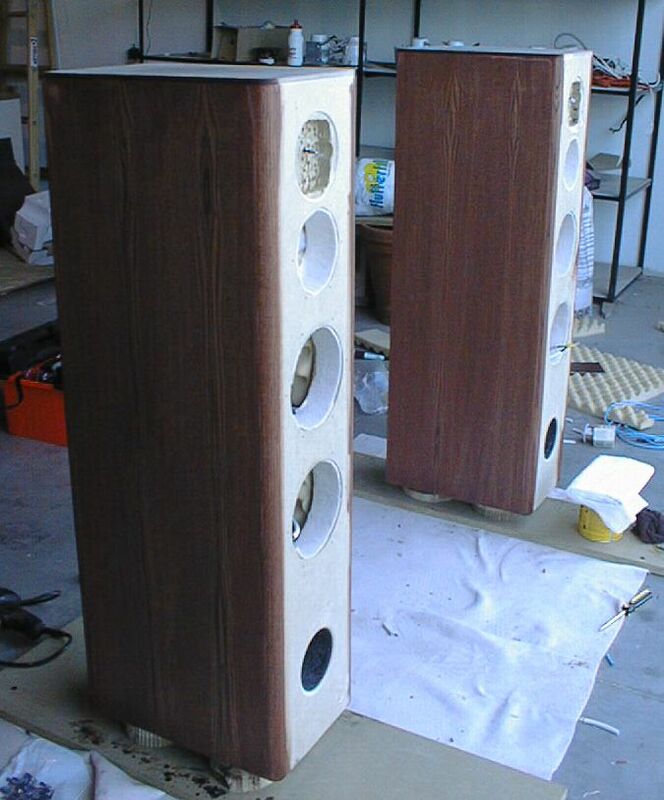 I don't think anyone can describe the feeling that you get when you're only hours away from finishing a brand new pair of speakers. Speakers that you just spent hundreds of hours in sweat, blood and tears slaving over. Screwing in the drivers one by one and taking the first look at your new masterpiece gives you a feeling of ultimate excitement mixed with anxiety. The big question, "How will they sound???" Well I was worried, very worried. Probably because I hadn't done many pre-finish tests on the drivers, crossover or cabinet. 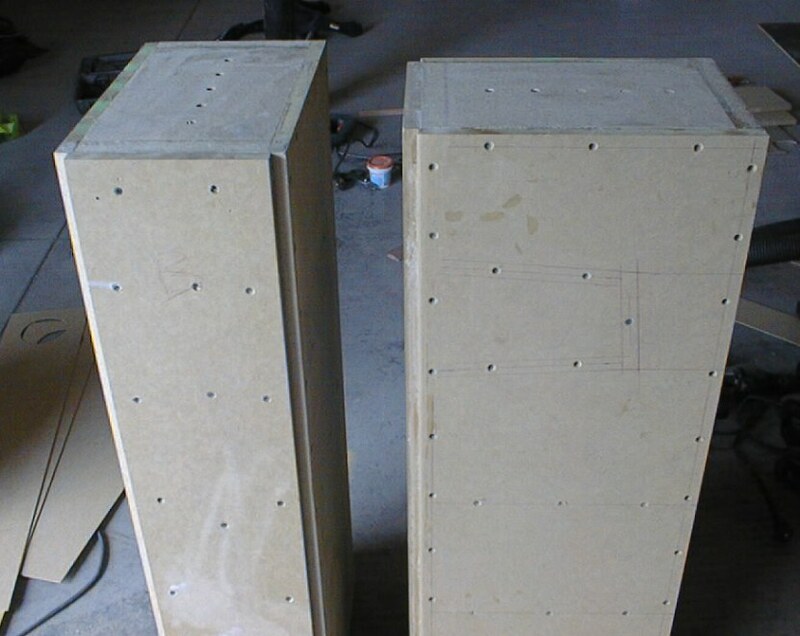 I trusted that Hi-Vi Research had done all their homework already when designing this speaker system and crossover. I didn't need to worry about padding the midrange or tweeter or getting just the right crossover frequency points to match for each driver. That was already done. The main thing I had to worry about was how well the cabinet was built and how well they would integrate with the drivers. I must mention that each speaker must weigh over 100 lbs. I haven't weighed them, but they are very heavy. The spikes on the bottom make placement on carpet somewhat of a challenge, so I have taken them off for right now. Now as with any speaker, they need some break-in time. Many manufacturers recommend as many as 100 hours before doing any serious listening tests or measurements on a brand new pair of speakers. But that doesn't stop you from listening to them right away anyway! 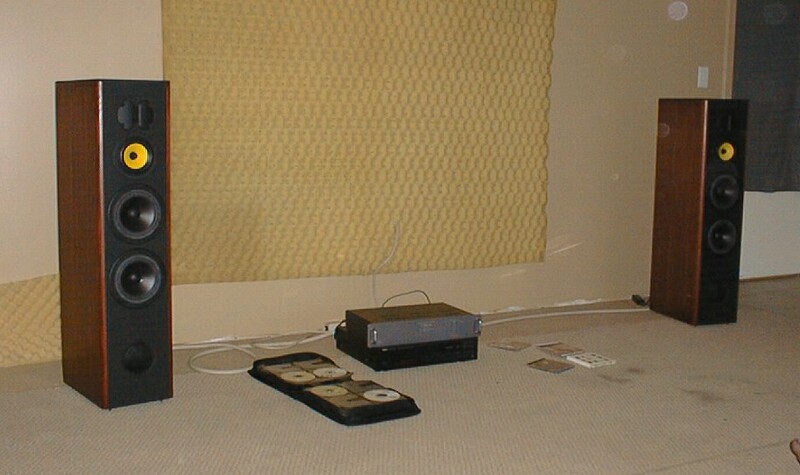 We set the speakers about 8 feet apart with a slight toe in so that the speakers actually pointed to a location about 3 feet behind the listening position. Our listening position is about 10 feet from either speaker. This was an initial set-up and so far has proved to be the most promising. The first disc I played was from a favorite band of mine, The Beautiful South. Lead singer Paul Heaton has a voice in a range that many speakers simply cannot reproduce without adding some sort of resonant coloration. Mainly due to poor cabinet design, as his voice hits in the low 300 Hz which is problematic for most conventional speakers when it comes to male vocals. But first thing I noticed when popping in Painting It Red was wow, this is the first time I've really heard how his voice is truly suppose to sound! It was incredible rich and pure. In the lower range, there was no coloration whatsoever. In the upper range you could hear the saliva in his mouth as he opened and closed hismouth to sing. The plucking of the guitar sounded natural and smooth. Once again no added resonances to taint the notes of each string. Now all doesn't go without flaw, I can tell right now the midrange is very forward. Even given its 86 dB sensitivity sitting right between the woofers (90dB+ and the tweeter 93 dB, though padded, has very little padding at all). It's not that the midrange driver sounds louder, but that the overall tonal balance puts more emphasis on the mid frequencies. So I am hoping that as it breaks in it will tone down, soften up a bit and smooth out with the rest of the drivers. 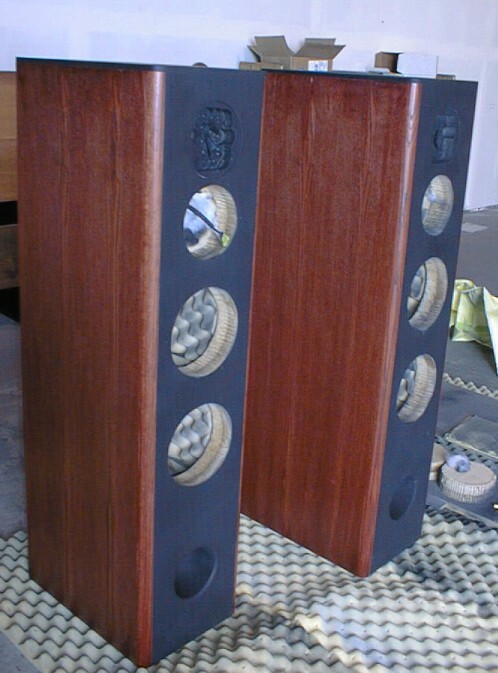 The ribbon tweeter makes the speakers have a very localized sound. As you walk around the room, the tonal balance and image changes drastically. However, there isn't a one single sweet spot where it sounds "the best". So far I have noticed that the speakers have multiple very acceptable and very smooth points of listening throughout the room. Each one just gives you a different sense of where the sound is coming from and puts more or less detail into the different instruments. The imaging on these speakers is miraculous. When you sit yourself down in a spot dead center of the the speakers, you physically become part of the musical experience. You lose mental sight of the left and right speaker and the music takes up a stage that extends beyond either speaker in each direction. They sounded in a word, great. 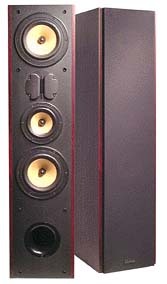 One other very surprising but obvious tonal thing to note is that these speakers have some serious bass. You wouldn't think that 6.5" drivers could move any air at all, but these speakers prove all those theories wrong. And not only bass, but very deep bass. During some well known deep bass passages of some favorite tunes these speakers just shined and gave it all they had and didn't strain. That's when a couple audiophile friends of mine stuffed a foam "port bung" into each of my ports and then said, "That sounds so much better! Now the bass sounds neutral and balanced." Granted they did have a point, I won't go into why the "foam bung" made it sound better to them. Other than that the bass was reduced, turning the cabinet into a nearly sealed enclosure. Of course some air was getting out. They absolutely loved it. I am still somewhat dubious of the whole thing, just because it alters the whole original design. 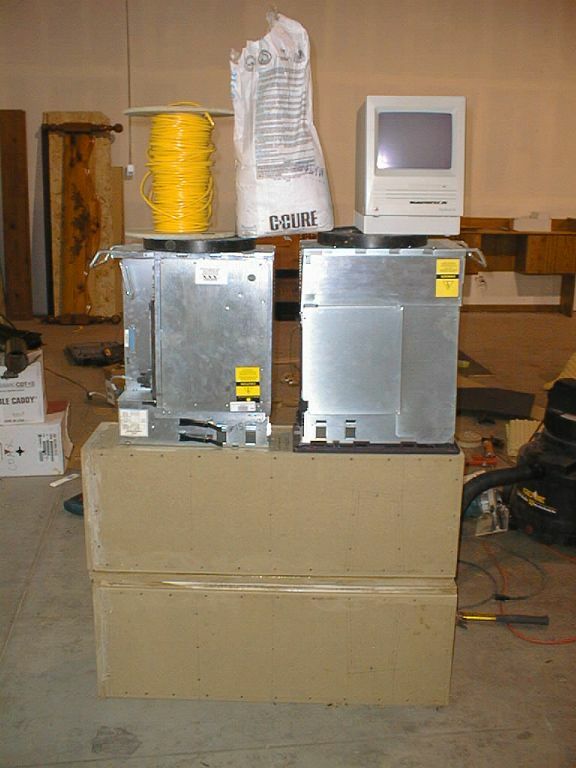 However since it is a simple and quick alternative, it makes for an interesting comparison between two enclosure types. I'll admit that a cello played with and without the bungs, sounded much better with the bungs, probably because it was less boomy. That's all I have time to write for now, but that's the basis of how these speakers are sounding. From a purely emotional and biased point of view I absolutely love these speakers and and falling in love more and more as I listen to them. I'm reliving all of my old CD's and just enjoying them all over again from a totally new point of view. And I'm having so much fun doing it! Stay tuned for more thoughts on these speakers. Feel free to look at all the pictures. 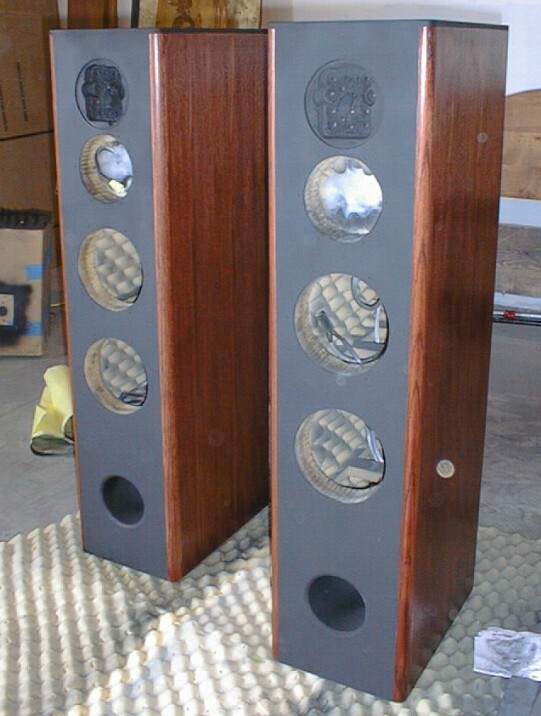 They don't do these speakers justice for what they really look like. Are they perfect? No. Did my own two hands create them? Yes! And that's the most important thing. Here's some recent pictures taken using the digital camera I just got. I've had these speakers for several years now and I still love them. They just keep sounding sweeter and sweeter. Measured vs. Calculated Impedance Plots Swans C3 Center Channel? ?